Shagufta Mehdi expresses herself best through larger than life and breath-taking florals that find stimulus in nature. She says, “I owe being an artist to flowers.” Living amid abundantly green surroundings in the city of Nagpur, India, her muse is never far away. She paints in the representational realistic style, drawing inspiration from the 20th century naturalist painters. She also fearlessly treads the road of everyday paintings which capture the Indian streets in all their myriad shades and enigmas. Born in a family of hobby painters and artists, the brushes and the easel seemed like a natural choice, but it was only in her twenties that she seriously began envisaging a career in art. Since then she hasn’t looked back. Her father, an avid reader and academician would often give her books on art which fanned her creativity. “He was truly and luckily for me, my first art teacher,” she says. Shagufta holds a Bachelors degree in art from LAD College, Nagpur. She has been greatly influenced by the works of Richard Scmidth, Jeremy Lipking, Daniel James Keys and Michele Dunnaway and deeply admires their craft. She also constantly attends online and live workshops to foray into newer arenas and hone her skills. One such workshop that she attended and particularly enjoyed was a course in Hyper Realistic Painting under the famed artist John Bayalis. She has also had residencies in Painting Techniques with Alag Angle and Landscape painting in watercolours with Milind Mullick. 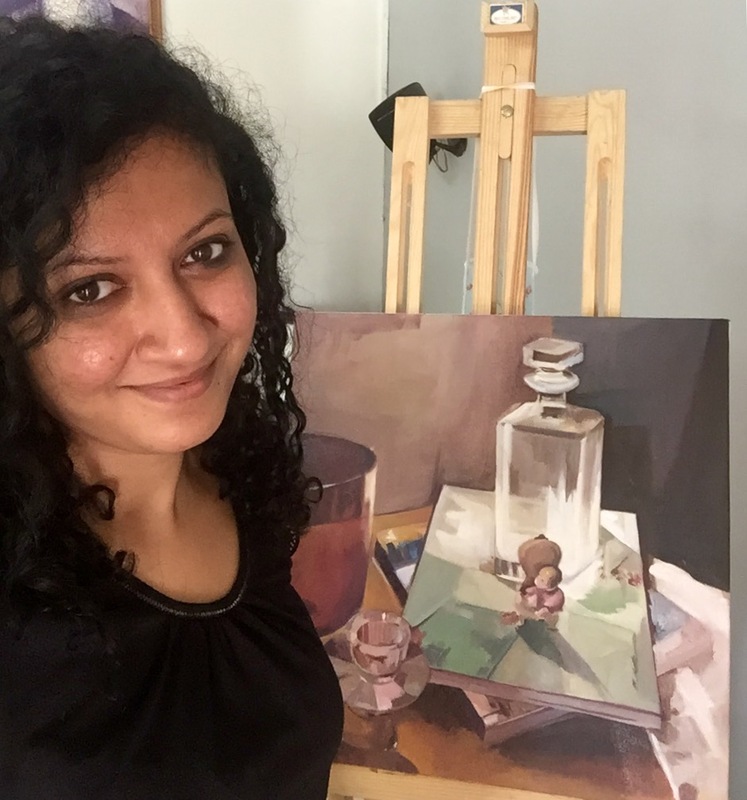 Although Shagufta has always loved working with watercolours she has gradually learnt to appreciate the viscosity of oils creating her best works through this medium. With this shift of medium also came an inspiration to create portraits. She firmly believes that a face is a book waiting to be read. She perfected the art of Portrait painting Alla Prima in oils under Rishi Kapil. The notable Prof. Vilas Tonape of Methodist University, USA has been another major influence in her life. It all began when she studied the art of portrait painting in oils from him. This not only perfected her oil strokes but opened up a brave new world of portraits. Later she also organised two demos of oil and pastel portraiture for Prof. Vilas Tonape at Chitnavis Centre, Nagpur in December, 2016. Collaborating with the same institution, Shagufta Conducted workshops titled ‘The Joy of Painting Watercolors’ at Chitnavis Centre for Arts and Sachee Art Gallery in 2016. Beautifying the city of Nagpur with large murals has been one the most satisfying projects of her life. Shagufta was the project head for 3 Street Art Festivals in the city called ‘Canvasing the Street’ 2012, 2013 and 2014 respectively. In the same vein she helped create a mammoth 6o’ realistic mural with a US based mural artist Augustina Droze. Shagufta wants to travel the world and often seeks ways to combine her two passions as she that the more places you see, the larger your canvas is. With brush in hand and never far from the colours that define her life Shagufta Mehdi lives in Nagpur India with her husband and son. Showcasing works at ‘Sachee Art Gallery’, Nagpur.